Similar to the hugely popular Majestic Range, our Monaco inground swimming pool offers an open, unhindered swimming area with the swim-out and steps set back from the main swimming area. 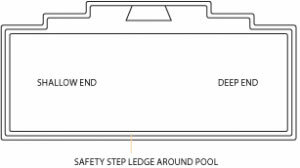 An “Easy Step” is an added feature to assist safe exit from the pool without limiting the swim area. The Monaco Range of swimming pools is designed to enhance your outdoor entertaining area by providing centre entry and exit points and generous seating. This particular swimming pool range boasts a 10.5, 9.5, 8.5 x 4.4 wide and a 7.2 x 3.4 wide. Add a slimline Monaco at 8.5 x 3.45 and you have an elegant centre piece complimentary to modern surrounds. Clean functional lines of our Monaco swimming pool come to life with the installation of light coloured tile surrounds, contrasts of timber decking or lush grass landscaping. Glass fencing further compliments this swimming pool design. As with all Barrier Reef Pool designs, the Monaco range incorporates the safety step ledge for junior swimmers, non-slip steps, smooth edges and vibrant shimmer colours. Whether you want a swimming pool long enough to swim laps in or a pool perfect for entertaining and relaxing, the Monaco range is ideal for all occasions.